Even in the second half of the 1990s, there was no end in sight to the economic stagnation that started with the bubble's collapse. The waning Japanese automotive market showed signs of expansion for a time around 1995, but thereafter contracted suddenly, bringing annual sales to below four million units in 1999, the lowest number in 14 years. At this time, the Japanese automotive market became primarily focused on replacing retired vehicles. All-Toyota faced tough conditions as its market share dipped below 40% from 1996 to 1998. 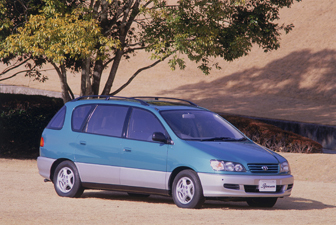 It took back its 40% market share in 1999, however, by riding the minivan boom that started in the mid-1990s, rolling out the Ipsum (1996), Corolla Spacio (1997), and Gaia (1998), as well as three Car of the Year Japan award-winning models: the Prius (1997), Altezza (1998), and Vitz (1999). In product advertising, Toyota targeted the family demographic by creating an original mascot character, Ipoo, for product announcements of the Ipsum, released in 1996. It also sought to attract new customers to dealerships by hosting major test-drive events and by conducting joint advertising for the Townace Noah and Liteace Noah, also released in 1996. In 1997, Toyota started running TV commercials to promote its Toyota Welcab series for the disabled and elderly. Meanwhile, in technology advertising, Toyota promoted All-Toyota's wide safety initiatives, including the release of its collision-safety body (GOA) technology, and its completion of making ABS and airbags standard on all Toyota vehicles in 1996. In light of growing public awareness of environmental issues, Toyota launched company advertisements called the Toyota Eco Project. The ground-breaking and large-scale advertisements, which introduced Toyota initiatives while presenting various environmental themes such as carbon dioxide reductions and waste issues, went past their goal of maximizing the impact of the new Prius release by having a major effect on society. Amidst all this, Toyota took its 60th anniversary in 1997 as an occasion to embark on a major organizational reform of its domestic sales and marketing division. With its new medium-term plan, 'Vision 2000', in 1998 Toyota made a clearer distinction of its five domestic sales channels, and also experimented with brave new forms of marketing, such as the 1999 opening of the Mega Web showroom in Tokyo.